The trip was wonderful, relaxing and stress-free. Almost everything went smoothly. If it were not for needing to GET THERE and GET HOME, the trip would have been perfect. The difficult (stressful - lets not kill each other moments) part of the trip was getting to and from Puerto Plata. Beth dropped us off, we quickly learned we were at the wrong airport and needed to be at the main PAP airport. I chased her down and we loaded everything back into her truck. At the main airport we learned about an exit tax (X 7 people) that we did not know about. That put a serious dent in our cash flow for the week, Troy forgot where he was for a second and attempted to argue that when he booked the flights, he was never informed of this expense – therefore he could not be expected to just fork over the cash. HA. Silly Troy. We all took three giant steps away from the counter to separate ourselves from the argument between Caribtair employees who don’t give a darn what Troy says and Troy, the eternal optimist. I kept saying “Troy, we’re still in Haiti.” Finally, Troy gave in, paid the exit tax and we headed to the gate for a long wait. The flight had 12 people on it. That is 7 of us and 5 other lucky souls. It was to leave at 4:30. It left at 7:30 instead. The daytime flight in a scary little plane became a night-time flight in a scary little plane. 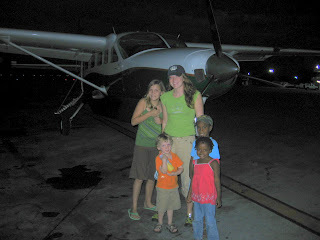 Here are the kids right before we took off. Then the guy asked the pilot if he had radar. Nope. No radar. Not working on that particular plane. Then the guy asked the pilot why he was taking the route he was taking, that it was not the best way to go. Then we went through a nasty patch of rain. Buzzers kept going off in the cockpit. The airplane leaked so you could feel water coming through the windshield. I was certain we would die at that point. I prayed for our lives. We got through the storm and we all calmed back down. Until the next storm, the whole scene replayed itself. Once we were safely in Santiago, I asked Troy and the girls if they thought we might die. Troy admitted to wondering if this was how it would all end. Paige said she was pretty scared, and Britt claims she thought it was “cool” --- I cannot confirm that she really thought that in the thick of the storm, we were all too afraid to talk. I never did an undie-check to see who was really afraid and who was calm. My favorite part, I had been praying and totally afraid. We were about 2/3 through the first storm. Isaac was sitting with me. He said “WE MADE IT!! !” I said, “Isaac, we’re in the middle of a storm, we made it where?” His reply, “We made it far away from Port au Prince!” It is always nice to have an optimist next to you in the middle of a storm. :) I love that boy! The flight took 1 hour and 50 minutes. It should have taken an hour. Troy was tracking it on his GPS and says we flew straight East almost all the way to Santo Domingo, then turned north. Instead of cutting across the country we made a big square. We slept in Santiago Friday night. Saturday as we waited for our bus to take us to Puerto Plata we realized that somewhere in the last year of staying put on the mission compound, we forgot what it was like to travel with five kids. We laughed at how dumb we are to think we can just jet around with five kids the same way we did when we had only Britt and Paige. Troy said "we're so dumb," at that moment Noah pushed Isaac who fell backward into Hope who fell into a lady in line behind us. They all started bawling. I joined them. After the bus ride we took a mini van taxi cab to the resort. The minute we arrived and checked in, Troy went from totally stressed out guy to party guy and things were wonderful from there on out. Apparently trying to figure out how to get this crew across an unknown foreign land, using five different modes of transportation when he does not speak Spanish was stressing him out a bit. He admitted to having some serious doubts about whether or not we would ever actually get to the resort. The resort was beautiful, our two room apartment condo was a perfect set-up. The swimming pools were great. We enjoyed more hours of sleep in one week than we can ever recall. We could all get used to that kind of leisurely life. :) No one knocked on our door at 5am or 9pm, no one needed anything from us. The electricity and water appeared without any work on our part, there was even air conditioning. It was a wonderful, relaxing and restful break. Paige cried when we left Haiti and did not want to go on vacation so soon after being in Minnesota, she also counted down the days until she would be back in Haiti … which annoyed all of us, but we recognized a while back that she is the true missionary of our group. She is an adorable weirdo that we love, even if we don’t totally understand her. She popped out of bed at 5:15 this morning excited to go home and "see her peeps." The resort was mainly occupied by British people, making for some great people watching. We were amazed at how curious our family was to so many. At least six people just flat out asked “Why are they black?” Adoption is not so well known in the D.R. and England I guess. The maid did not seem to believe that both Jack-Jack and Hope could be ours, she asked both Troy and I separately on two different days. She must have thought we were lying. We had fun shopping at little touristy shops. Our favorite part was finding Haitian people to talk to. It was fun to watch them do a double take when we greeted them in Creole. Our favorite guy just kept calling us liars, incredulous and unbelieving that we live in his country. It was cute. Paige chatted up a Haitian boy at Burger King (that's right -- they have fast food in the D.R.) and got his life story. It is amazing how many people have split their family up in order to get someone to the D.R. for work. The little boy told Paige he really misses his Mom but needs to live with his aunt. Lastly, guess what our favorite taxi / tour driver was named? Eddy. Steady Eddy. The law of Eddy follows us three countries. Our MN Eddy, our Haiti Eddy and now a DR Eddy. In true Eddy fashion, he worked us hard for huge tips and answered questions with made-up answers. On the last day we switched to all-inclusive, the kids made full use of the free food and drink and all had 17 "Banana Mama's" a fruity ice drink. It was fun to eat non stop all day, but Troy had high expectations of us all and most of us have stomach sizes that do not allow for the kind of eating he had in mind. The rest of the week we used our kitchen for breakfast and lunch and had dinner at different places each night. Britt got to have a date night and so did Paige. This morning, the ride to Santiago made most of us sick. The van driver was .... aggressive and manic. The road was winding and climbing and bumpy. Isaac actually threw up on himself and Britt. I was impressed with how Britt handled it. Then about ten minutes later I needed to ask the guy to pull over so I could get out and try to walk off the nausea ... it sort of worked and I managed to keep it to dry heaves with just a few spectators on the side of the road. Once to the airport, we repeated our mistake and got dropped off at the wrong place. Britt and Ike changed clothes in the parking lot and we were good to go. The flight home was beautiful. Same little plane only it was our family and one other guy. The pilot seemed sure of himself. The mountains stick up above the clouds in some places and the flight was never scary today. Peanut and Phoebe did well without us. We were all happy to retrieve our two missing family members. Matt and Tina had trouble in Dallas and are coming in tomorrow instead. We are so anxious to be with them and show them our lives in Haiti. They have never been here and have not seen Hope or Isaac in 14 months ... plus, they've never met Phoebers.